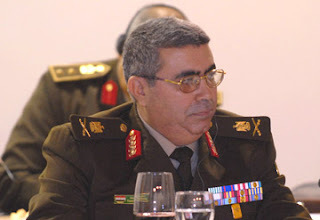 The armed forces council has appointed major general Tarek Mahdy as a temporary head for the ERTU “Egyptian radio and television union” till the council someone suitable for this important position. Mahdy used to the head of the Egyptian air defense forces from year 2000 to 2005 as far I have found when I searched in his background. He was born on 22/11/1950 and he was graduated from the war school in 1973 just before the way by few months. Of course he is a 1973 war veteran. He took a lot of medals and also a lot of military courses in Air defense forces. He is married and got 2 boys and one girl. Many people are not comfortable that a military man who has no experience in media from near or far to hold this position in a critical time like that. Despite my concern I believe the council want someone they trust to hold this important position , they chose someone from the army itself who has no relation so far we know with the media universe of the NDP. This means a lot. Already starting between February 10th and 11th something happened in ERTU aside from the complete control from the army. If you remember more army troops head at the eve of February 10th to the ERTU building and to the presidential palace even before the huge protests that encircled them in these critical 48 hours. First of all these communiques that army used to announce were all sent from the TV unit in their HQ at Moktam. That TV unit in that HQ has its own transmission unit and also its own red button to turn off the radio and TV broadcast in Egypt according to some sources. If you paid attention you will find that Omar Soliman read the step down announcement from that unit , he did not read it from the Presidential palace nor from the ETRU. In that strange provoking interview with Abdel Latif El-Manawy in Masr Al Nahrda Mahmoud Saad made a reference to some important and critical decision the the head of news sector in Egyptian TV took in the last hours before the step down announcement that history will not forgive later , later General Etman praised El-Manawy for his patriotism. What Saad and Etman said made me believe that the Suzanne Mubarak's godson Anas El-Fiky "the former minister of information" had some sort of plan to stand with Gamal Mubarak and the rest of NDP gang.Gamal Mubarak allegedly took that step down announcement from his dad's hand on February 10th at the Presidential palace pushing him in a dramatic scene so Jimmy had no intention to leave. "I do not know how true this is but according to all sources Gamal Mubarak was against stepping down"
Speaking about the media I am that not concerned about having an army general supervising on the ERTU but I am rather concerned to the facts that TV shows and TV presenters are being banned from Egyptian TV channels. Aside from the alarming fact that Mohamed ElBaradei is still persona non grata from Egyptian TV channels , we found out that any criticism to the Ahmed Shafik’s cabinet is not welcomed anymore. Last Thursday Amr Ellissy hosted on air Ibrahim Eissa who attacked Ahmed Shafik and his cabinet. In its re-run on Friday people were surprised to find that the whole part concerning Ahmed Shafik was cut !! Later we found out that Ahmed Shafik himself interfered and called the CEO of Dream TV 2 on the phone objecting on what Eissa said. Today we found out that Amr Ellissy’s popular show that exposed the poverty in Mubarak’s era has been stopped by orders from above. El-Lathy spoke with Wael Ghonim on phone and he told him that he did not know that if he would go on air again or not , he also added that there are still those who determine who should go on the air and who should not. To cover the story from all sides as much as I can there are some sources say that it has to do with some charges Mamdouh El-Lathy , the famous cinema producer “Amr’s father” is currently facing. To be honest I will highly doubt that. Nevertheless here is the part Ibrahim Eissa criticized Shafik without any editing. Moving to Misr El-Nahrda Mahmoud Saad has resigned from the popular TV when he found himself technically being ordered to interview Ahmed Shafik in tonight’s show. Originally he was going to have an interview a group of January 25 youth. Saad made it directly that he does not take any order of anybody now. The cleaning up needs time. I am sorry to see it go on so slowly. Yet as long as it keeps on going, it is a progress. Please Egyptians don't slow down, don't give up! What you have started will take years. So be strong! Great blog. It's great to hear the voices of people straight from the source. I live in Tel Aviv and have several friends in Egypt who seem to be cautiously pleased with the current change, I've written a little bit about it myself. I wish you all the best, and I hope the transition from regimes only affects you and your country positively. Keep writing, voices like yours are what people need to hear. It will take time, patience and a lot of work to decontaminate 32 years of Mubarak and his microbes not to mention Sadat and Nasser's garbage. nice post...Can you please explain what did Saad and Etman said because i didn't see the interview? another good report. I supported Mr. Mahmoud Saad. he has the right to his show and he didnt make money for Shafiq regime or mubarak regime or Egyptian tv station! he makes money from companies that make ads on his show. Mahmoud Saad show is the only Egyptian station that make profit 100 Million Egyptian pounds last year! Shafiq is attacking Mahmoud because he is with the ppl and he knows ppl love him. Shafiq rather see the private companies in Egypt take their money outside Egypt rather than invests on Mahmoud Saad show which bring money to the tv station, workers and Egyptian people from the taxes they got from this companies! As Mr.Eissa pointed out the key issue is the transparency and arbitrary decisions taken in the closed rooms. we need to have a clear schedule for all the reforms that will take place in the upcoming months, and hold a meeting that doesn't exclude any group and see how we can meet these milestones. Up till now I don't see any clear steps from the government.